The MP25-MG calculator prints at speeds up to 4.8 lines per second in two colors. An ergonomic key design allows you to compute tax calculations, cost-sell margins, and rounding with comfort and ease. Easily view up to 12 digits with an extra-large florescent tube display while keeping time and date with a built-in clock and calendar. The MP25-MG calculator incorporates a fast, quiet, two-color, high speed ink ribbon printing system to ensure quick and efficient calculations. When you are not calculating numbers, a built-in clock and calendar make it a very useful addition to your desktop. With sophisticated built-in features such as tax, profit margin calculations, a 12-digit display and high-end durability, the Canon MP25-MG printing calculator is always ready for business. When our old calculator went, we were forced to replace it. We're accountants and need the tape so use of a smartphone or other modern equipment won't work. The machine is more than adaquet and other than the 0 key being in a different place, is very workable. Cannon MP25-MG printing calculator. This is an excellent calculator. It is very user friendly, and was an affordable price. I have used many calculators over my 28 years as a business manager and this Cannon is one of the best ones I have used. As I have gotten older, the numbers are a little harder on the eyes, and this one is really easy to read with a nice size screen. The keys are not overly sensitive, so if my fingers slip I do not have to key in my work all over again. It looks good, and it is not too large, so it does not take up all of my desk space. It also goes "to sleep" when not in use, so I do not have to turn it on and off unless I want to. I do highly recommend this calculator. After alot of searching and reading reviews I settled on the MP25-MG. I have had Canon calculators for years but the last one (MP25DV) I had was just ok. I wasn't sure if I was going to stay with a canon. I use the triple 0 key alot so I was happy to find this machine offered it. I like the redesigned keys. The only reason I won't give it 5 stars is the power saving feature of the display can be hard to get use to. I don't always look at my calculator when I first start typing so if the display is on sleep mode the first keystroke has to wake it up. this printing calculator is just the right size for my desk, is easy to use, and seems to be very well made. Easy paper feed too! This is a great desktop printing calculator. It is quiet, which I love! 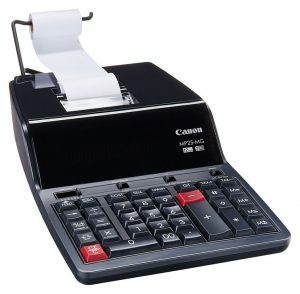 The calculator I have at work sounds like a dot matrix printer, which becomes very annoying, very quickly, so I'm ordering one for work. It is also fast, with no problems keeping up. The keys do have a little too deep depression to my liking, but I am getting used to them and it's not as big a deal as it was at first. The layout of the keys is similar to my old calculator, which is very helpful. I do like the size of the printout on the tape- it is clear and easy to read. The display is also easy to read. The size of the calculator is great too. It is big enough to be sturdy and stable, but smaller than most in its class. The reason I give it a 4 instead of 5 is because the paper sometime rolls back into the calculator. It doesn't do it all the time,but enough to be bumped from 5 to 4. I highly recommend this calculator. Canon MP25-MG calculator, I received the MP25-MG calculator on the day it was promised when ordering in-store for delivery. It does everything I hoped it could by looking at the word description. I deal with calculations in the 1,000-1,000,000 ranges so the "000" key was the most needed button on the keypad. I love how much easier it is to run a long column of calculations now without having to think " now just how many zeros do I need to put in for that entry?" Thanks for offering it in your stores and on-line. It is quickly becoming my favorite office tool.